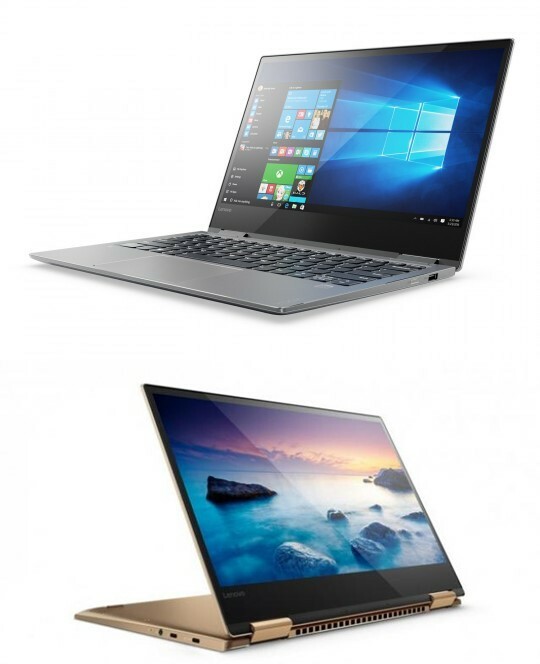 Lenovo took to MWC to announce new additions in its ever expanding 2-in-1 range. The hinge in Yoga 520 and Yoga 720 can flip the display in such a way that it can be used in a wide variety of ways like laptop, tablet, tent and stand mode. The Yoga 520 will arrive in 14″ and 15″ sizes while the Yoga 720 will be offered in 13″ and 15″ variants. The more affordable of the two, the 520 series comes powered by the latest Intel Kabylake processors, upto 16GB RAM, JBL speakers with Dolby Audio Premium, 1TB of HDD or 512GB SSD storage supporting upto 1080p resolution in 14″ and 4K in the 15″ devices. The premium 720 range offers Nvidia Geforce GTX 1050 discrete graphics in 15″ while the 13″ model uses Intel integrated graphics. Both are running on the latest Intel Kabylake processors and can also be configured with upto 16GB RAM, 1TB HDD or 512GB SSD storage. Windows Ink is supported since Lenovo has added support for active stylus and fingerprint sensor models will work with Windows Hello. Colour options for the Yoga 520 are Mineral Gray, Onyx Black while the Yoga 720 comes in Platinum Silver, Iron Grey and Copper (13″ only). The devices will be arriving to India in the coming months.